Firstly thank you very much for approaching CareerGuide.com for seeking clarification on your query. I am sure that the experts here will be able to guide appropriately. Company Secretary is one of the very reputed and prestigious professionals in the country after the Chartered Accountancy, Cost Accountancy, MBA and Law. You have rightly chosen this course for your career. The reason today commerce students apart from choosing Company Secretary course is that the legal world is getting highly complicated and the businesses are getting highly regulated. This gives the need of legal professionals not just in general laws but also about corporate and secretarial laws. A Company Secretary is a highly placed professionals who is considered as the link between the stakeholders, management and the government authorities. A Company Secretary is not supposed to be confused with Personal Secretary or Secretary to CEO or Managing Director in the company. A Company Secretary is a chartered position under the Company Secretaries Act 1980 and is mandatory for companies to appoint a qualified person as their Company Secretary. I understand from your query that you have scored 45% in your BCom degree. With this percentage you can definitely get admission to the Company Secretary course since the minimum percentage required as per ICSI is 45% only. However my dear aspirant, 45% is very less in graduation degree. Hope you did not take graduation very lightly since good marks in graduation always help you in future for career and or for getting admission to master degree or professional courses like CS, etc. You should certainly visit your local city based ICSI Chapter office and fill the application form for Executive Course of ICSI which can be done after graduation. 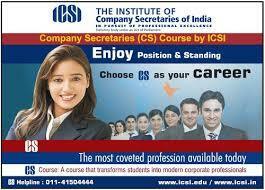 Since you are a graduate, you need not do the Foundation course of ICSI. All other information is also available on the ICSI website that is: www.icsi.edu. My Dear Aspirant, please do not be very casual for this course, since this is a relatively tough course and passing percentage is not like graduation. The minimum passing percentage for any paper of ICSI is fifty percent (50%). Everybody has some career goals in mind. Something they are thinking of doing or becoming. For Commerce students, there are many avenues where they can build up a good career in future. Company Secretary Course is one such course which can be taken as a profession.It is good choice to pursue "[Company Secretary]" along with Graduation.Stages to become Company Secretary The student who would like to join the course after 10+2 pass or equivalent has to undergo 3 stages to pursue the Company Secretaries Course.Foundation Programme. [Executive Programme]. Professional ProgrammeThe Student who would like to join the course after passing the Graduation has to undergo 2 stages of the Company Secretaryship. i.e. - Professional Programme can be pursued only after clearing the Executive Programme of CS Course. The Minimum Percenteg to pursue CS course can be a PASS Class. So even with your 45% in B.Com. You are eligible to apply for CS Course. 1. An expert in Company, Corporate, and Security Laws. 5. Corporate Planner and Strategic Manager. The CS has vey wide scope in the industries now a days. A qualified Company Secretary has openings in industry and also has scope for practicing as an Independent Professional. CS course offers lucrative career options. After successfully completing this course, you can get into multi national companies for jobs. CS acts as a compliance officer who may provide legal advises in [area of Corporate Laws, Capital Market, Corporate Governance], etc. Job Opportunities exists in both Private and Public Sector Companies. Some of the areas where you have chances of the jobs are SEBI, Stock Exchange Markets etc. A qualified CS can also practice independently. Many government companies also employ CS such as AAI, ONGC, [State Infrastructure Development Corporations] etc. Opportunities also exists in banks. Some of the other areas where in one can work are government financial institutions, bureau of public enterprises, accounts branch of government law service. Further doubts or queries feel free to contact. Can I do Bcom(hons) with company secretary course?